In Massachusetts, there are two ways to get your license back for a Breathalyzer refusal. Although the suspension will vary according to the number of prior convictions you have and your age at the time of the arrest, it is possible to appeal the suspension. The diagram below describes the different ways in which you can appeal to get your license reinstated. Length Of Breathalyzer Refusal Suspension Depends On The Number Of Prior DUI Convictions And Your Age. A prior conviction includes out of state offenses or assignments to an alcohol treatment program. While you do not have to appeal a refusal suspension, it is important to understand Massachusetts OUI laws so that you can make an informed decision whether or not to pursue this appeal. 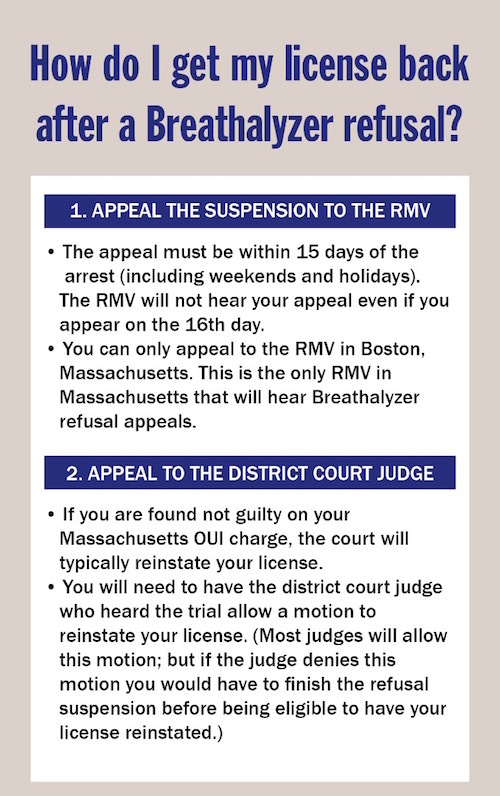 Given the short time limit to appeal a refusal suspension to the RMV, it is easy to lose your ability to appeal the breathalyzer refusal suspension and then to the District Court where your OUI case is being heard. Will the jury know if I refused the breathalyzer? Attorney DelSignore is an experienced Massachusetts OUI lawyer that has handled numerous Breathalyzer refusal appeals and can explain the process to you. Call immediately to begin the appeal process and set up a free consultation, 508-455-4755 or 781-686-5924.